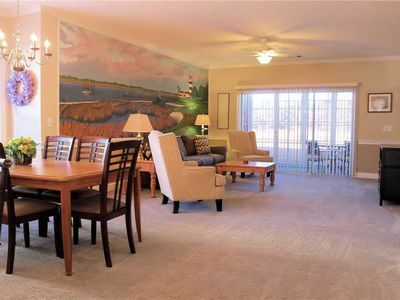 N. Myrtle Beach Condo at Tidewater - Golf & Pool! 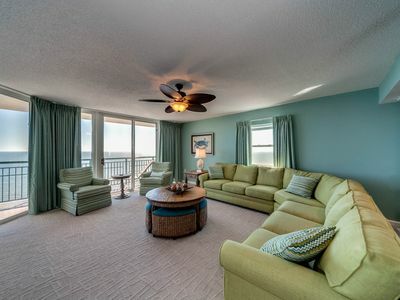 Experience the best of North Myrtle Beach at this stylish 2-bedroom, 2-bath vacation rental condo that comfortably sleeps up to 5 guests. 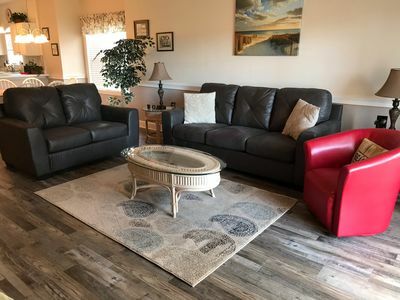 Situated in the Tidewater Plantation, this peaceful condo overlooks the Tidewater Golf Club and features a beautifully decorated living area, a gated community with pool and hot tub, and nearby access to Myrtle Beach and all the conveniences of downtown. 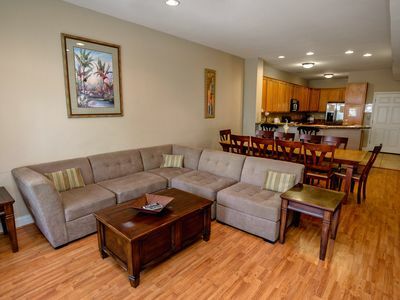 Enter the living room of this recently upgraded condo to find comfortable brightly-colored couches and an accent chair surrounding an enormous flat-screen Smart TV. 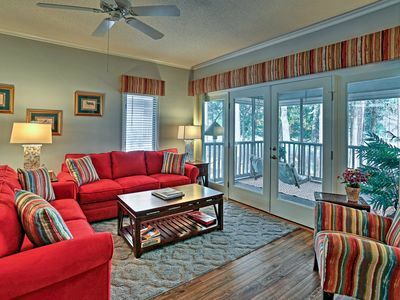 Open the French doors to let in the breeze coming in off the screened-in porch, where you can enjoy a cup of coffee in the morning from the hanging swing. The open plan arrangement leads out into the dining area, with plenty of room for your entire party to gather around for a meal together. 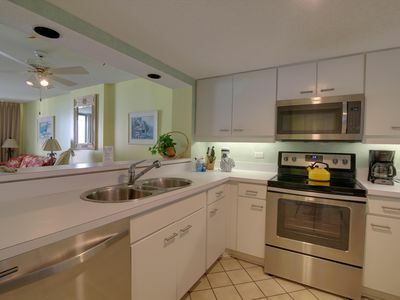 The pass-through makes it easy to serve directly from the fully-equipped kitchen, which features granite countertops, a Keurig and all the culinary essentials. 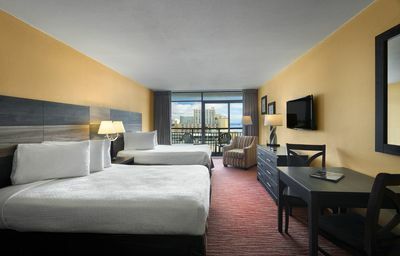 Stretch out in the master bedroom’s queen bed and enjoy the privacy of your own 32-inch flat-screen Smart TV and en-suite bathroom. Two sinks, granite countertops, a deep soaking tub, and plenty of storage in both bathroom and bedroom make it easy to make yourself at home. 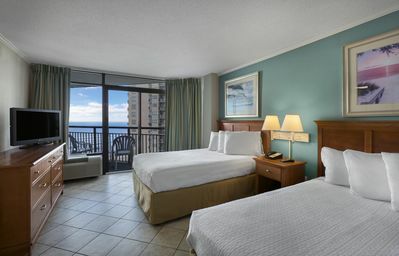 In the second bedroom you’ll find 2 comfortable full-sized beds and a third flat-screen Smart TV. This bedroom benefits from a large adjacent bathroom with a shower/bath combination and another granite-topped sink. In the gated complex, you’ll have access to all the community amenities, including golf, a swimming pool, a hot tub, and fitness center. 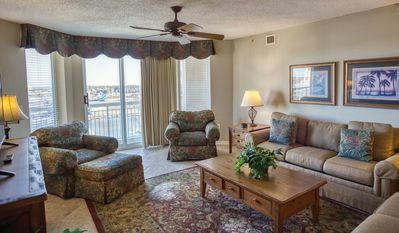 Tidewater Plantation is only 1 mile from Cherry Grove Beach, which makes for a pleasant 15-minute stroll or an exceptionally short drive to deep sea fishing, waterskiing, boating, or swimming. 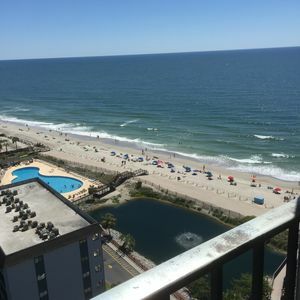 Although you’ll already be staying on a wonderful golf course, there are over 100 courses nearby, many of the championship quality - so feel free to hunt around for your favorite! 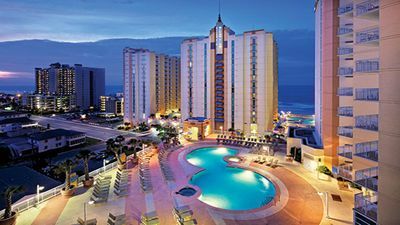 You can also enjoy tennis, surfing, parasailing, or one of the area’s many theme parks close by. 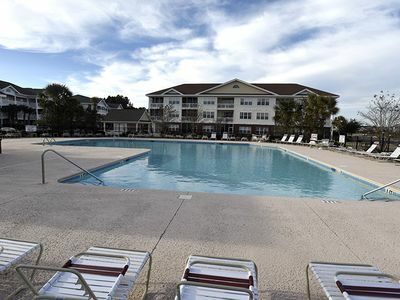 Enjoy retail therapy at Myrtle Beach’s outlet mall, head down to Restaurant Row for an incredible meal, or wander Barefoot Landing for the best of both shopping and dining. 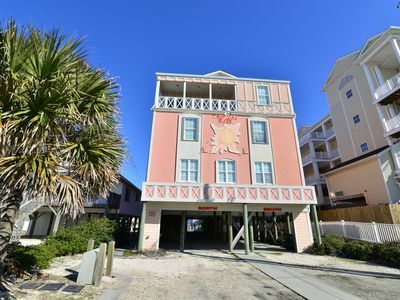 Corner Unit-The Flamingo Palace-All New for 2019! 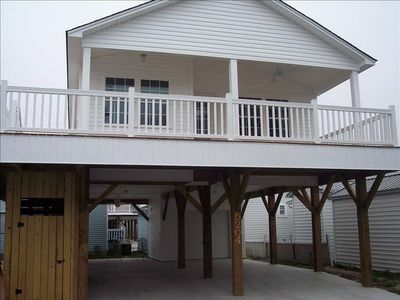 See Our Sneak Peek Pics! 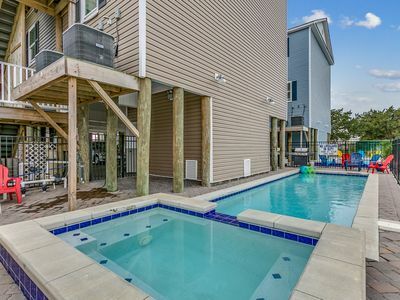 SUMMER 2019 weeks going fast, book now! Tropical Rays Beach Castle feat. 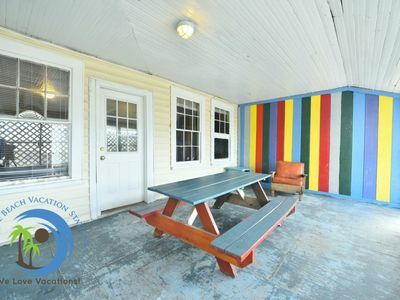 POOL * GRILLS * GAME ROOM * HUGE HOME! 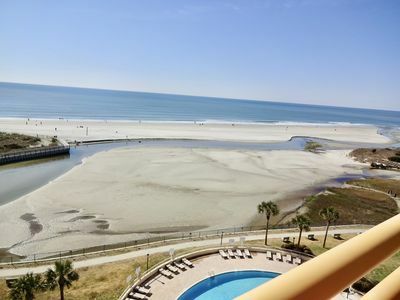 Beautiful DIRECT oceanfront condo, great amenities & location! Visit Ripley Aquarium, Feed The Sting Rays! 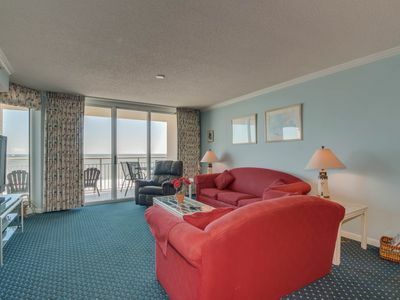 Super Oceanfront Studio Condo With Million Dollar Views. 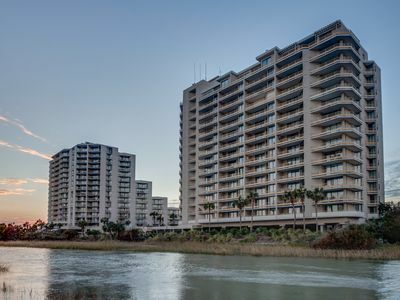 Barefoot Resort North Tower Unit 1107! 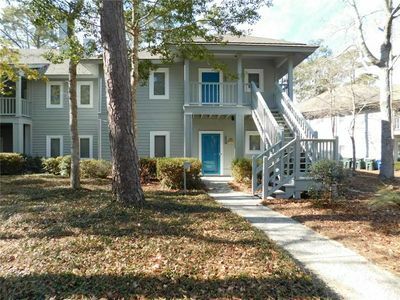 3BR/ Great Waterway Views/Large Pool/Shopping at Barefoot Landing very close. 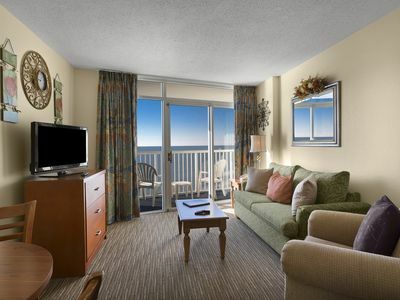 Book your get-away today!